Although water quality is extremely important to the Hawaiian Islands in terms of tourism and coastal ecology, very few studies have been done to investigate water turbidity along the south shore of Oahu. The reintroduction of sediments from the sea floor to the water column plays a major role in the turbidity of this area, and is heavily influenced by physical oceanographic forces such as currents, swells, and tides. This study focuses on using Acoustic Doppler Current Profiler (ADCP) echo intensity to examine the relationship between the aforementioned physical forces and changes in suspended sediment concentration on the south shore of Oahu. Three data sets were used for this study, each from a two-week long ADCP deployment in either June 2003, June 2004, or July 2004. Concurrently with the July 2004 ADCP, a Self-Contained Underwater Fluorescence Apparatus (SCUFA) was deployed in order to obtain optical data to compare with the acoustic data. Swell events, which provide the strongest energy source, were expected to correlate best with large changes in turbidity, while smaller correlations were expected for tides and currents. Significant swell events during the June 2003 and July 2004 deployments allowed for acoustic and optical backscatter to be correlated with significant wave height, while the June 2004 deployment was used to examine the correlation of ADCP echo intensity with tidal height and current velocities. Acoustic data generally showed a strong correlation with swell events, and a weaker correlation with tides and currents. Optical data did not fully support the acoustic data, though there was a high correlation between the maximum significant wave height and SCUFA turbidity with a 24 hour lag. Turbidity is an important economic and ecologic water quality parameter, especially for the Hawaiian Islands. Every year, thousands of tourists visit this Pacific island chain. They contribute significantly to the economy as a result of their desire for warm, clear water and coral reefs. However, increased turbidity would not only harm tourists' perception of Hawaii as a destination spot, but would also adversely affect a coral reef ecosystem that profits from light transmittance through the clear water. Since, in many cases, suspended sediments (the largest contributor to high turbidity) are of a terrestrial source, turbidity is often linked with an increase in nutrients such as nitrogen and phosphorus (Wilber 1983). This can lead to harmful algal blooms, and an overall decrease in water quality. Lowered light penetration due to turbidity can starve photosynthetic benthic organisms from the light they need to survive. This applies to algae and plants, as well as most species of scleractinian corals due to their symbiotic photosynthetic dinoflagellates (Telensicki and Goldberg 1995; Woolfe and Larcombe 1999). The increased sedimentation rates almost always present in turbid water have another effect on coral reefs: massive amounts of energy are spent by the coral, in the forms of mucus production and cilia movement, in order to remove sediment from epidermal tissue, leading to stress and decreased coral health (Loya 1976; Rogers 1983). Without the reef to provide structure, a habitat, and a barrier from wave energy, many important indigenous fish and invertebrate populations would sharply decline. Figure 1. Aerial photo of site area offshore of Kaka'ako. 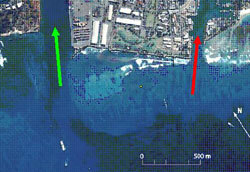 Symbols: channel to Honolulu Harbor (green arrow); channel to Kewalo Harbor (red arrow). Traditionally, turbidity has been measured via single point measurements. Secchi disks, consisting of patterned plates, are lowered from the surface to determine the visibility depth, also known as the Secchi disk depth. Sediment traps or bottle samples can measure the amount of suspended material directly (Wren et al. 2000). While generally accurate, these methods have very poor temporal resolution, as sampling is time consuming and cannot be done continuously. Recently, acoustic and optical backscatter instruments have been developed that allow for turbidity and suspended sediment data to be collected continuously over a long time period, and with excellent accuracy (Thorne and Hanes 2002; Thorne and Vincent 1991). Acoustic backscatter devices emit short bursts of high frequency sound, a portion of which is directed back to the instrument after hitting suspended solids in the water column. If the suspended solids are assumed to be uniform in size, the strength of the backscattered signal indicates suspended solid concentration (Wren et al. 2000). The ability to profile the entire water column and monitor temporal changes in turbidity is a great advantage of these instruments. Sound waves can be scattered by many things while traveling through water (e.g., air bubbles, temperature or salinity gradients, and turbulence) (Zhu et al 2000). Therefore, it is wise to verify acoustic data readings with optical turbidity or in situ data. Optical backscatter instruments use a series of photodiodes positioned around a light source to detect light backscattered from suspended solids (Wren et al. 2000). The strength of the backscattered signal is a measurement of both particle size and concentration for that point in the water column. A great deal of literature has been published on the use of acoustic backscatter echo intensity to measure suspended sediment. They mostly focus on the mathematics behind various modifications to the sonar equation, which are used to account for water attenuation and beam spreading effects (Webb and Vincent 1999; Crawford and Hay 1993; Thosteson and Hanes 1998). Quantitative data on turbidity is difficult to obtain, due to the intensive laboratory calibrations required for both optical and acoustic backscatter devices (Crawford and Hay 1993). Despite the importance of this topic, little information has been collected on the turbidity conditions of an area economically and ecologically significant to the Hawaiian Islands: the south shore of Oahu. Two large lagoons are located here, Keehi and Ala Moana though it is a principally non-lagoonal coastal area. Due to the shore line topography and coastal bathymetry, sources of physical forcing, such as waves, tides, swells, and currents, have the potential to drastically impact local turbidity, as the energies in these forces are used to re-suspend sediments and organic materials both on and offshore (Wilber 1983). The focus of this study is, therefore, to correlate changes in turbidity with sources of physical forcing, specifically tides, currents, and swell events. We will show that swell events, which carry the most amount of energy, will correlate best with large changes in turbidity, while correlations smaller in magnitude will be observed for tides and currents. Figure 3. June 2003 ADCP echo intensity (top), and significant (upper 1/3) wave height (bottom). In this study, an RD Instruments Workhorse Sentinel&reg; Acoustic Doppler Current Profiler (ADCP) was used to monitor acoustic backscatter, while a Turner Designs&reg; Self-Contained Underwater Fluorescence Apparatus (SCUFA) was employed for optical backscatter. Normally used to monitor current velocity profiles through the Doppler shift of the backscattered signal along each of four beams, an ADCP also records data on pressure, temperature at the instrument, and most importantly for this study, echo intensity profiles along each beam. The SCUFA utilizes a blue LED to record both fluorescence and turbidity through a 90&ordm; optical backscatter sensor. The study site was located on the south shore of Oahu, between Kewalo Basin and Honolulu Harbor, offshore of an area known as Kaka'ako (Figure 1). The site was in approximately 13 m of water, over a substrate composed mostly of reef with numerous small sand patches. A total of three data sets were used for this study, each from a two-week deployment in either June 2003, June 2004, or July 2004. During data collection, one data ensemble (consisting of pressure, temperature, echo intensity, current velocity, and other parameters) was recorded every second. The ADCP in the July 2004 deployment was set to collect one data ensemble per second continuously for the duration of data collection, whereas the ADCPs deployed in June 2003 and 2004 were set to collect one data ensemble every second for only the first twenty minutes of each hour. A concurrent deployment of an ADCP and a SCUFA system was completed in July 2004. The SCUFA was set to take a reading every two minutes for the duration of data collection. During the July 2004 deployment, a total of six in situ water samples (500  1000 mL) were collected at the SCUFA site using SCUBA, with date and time of collection noted. Figure 4. June 2004 ADCP echo intensity (top), tidal signal (middle), and current velocity (bottom). Negative current velocities indicate a negative directional current on an axis tilted 33 degrees east of north. Symbols: June 2004 Currents - Long shore current (blue); cross shore current (red). The top 4 m were deleted from the ADCP echo intensity data in order to remove the effects of sound waves outside the focused beam bouncing off the wave boundary (i.e., acoustic side lobe interference) and bubbles generated by surface waves. The echo intensities from all four beams of the ADCP were averaged for each data set, and then averaged temporally over each hour-long sampling period, resulting in one data point every hour. All echo intensities were depth-averaged to reduce inaccuracies accumulated as sound waves traveled through the water. A modified version of the sonar equation, usually used to account for these inaccuracies, could not be utilized due to the inaccessibility of certain parameters during the time of the study. Although depth averaging the data effectively eliminates the spatial resolution and measurement of absolute acoustic backscatter from the ADCP data, it retains fair accuracy on the integral echo intensity over the entire water column. Current velocities were measured by the ADCP in Cartesian coordinates, and area bathymetry caused local currents to predominate in long shore (approximately 123&ordm; from north) and cross shore (approximately 33&ordm; from north) velocities. Currents were transformed into along- and cross-shore components based on the alignment of local bathymetry (123&ordm; from north, along-shore). From ADCP pressure data, the significant wave height (i.e., the average of the upper 1/3 wave heights) was determined every hour to characterize swell events. Cross correlation analysis was used to obtain correlation coefficients (correlation between f(x) and g(x) produces φfg(x) = ) between the echo intensity and the swell, tide, and current time series with resolution of one hour over the entire data set and a 95% confidence interval. Variable currents, in combination with a significant swell event, caused the June 2003 data set to correlate very weakly with currents and tides, so this data set was used to examine echo intensity correlations with significant wave height. The June 2004 data set had no significant swell event, and the current velocity and tidal signal were more uniform, so this data set was useful in examining correlation of the ADCP echo intensity with tides and current velocities. The July 2004 ADCP data set, concurrent with the SCUFA deployment, was used to compare the optical backscatter against the acoustic backscatter. The SCUFA and ADCP data from the July 2004 deployment were not analyzed against the current or tidal time series due to strong forcing from two swell events and inconsistent currents. Figure 5. June 2004 echo intensity cross correlation analysis against long-shore current velocity (top) and against depth at ADCP site (bottom). Maximum correlation coefficient between long-shore currents and echo intensity occurs at one hour lag. The SCUFA was impaired by the growth of living organisms (biofouling) during the sampling period, as evidenced by a thin layer of algae located on the sensor upon retrieval. Since it was apparent from the trend in the data (Figure 2), that biofouling increased during and after the swell events, linear trends in the SCUFA data before and after the obvious peak were removed. The six water samples collected during the July 2004 deployment were kept in a dark, cool environment to prevent errors due to accumulation of biota. The water samples were filtered through pre-weighed Whatman nucleopore membrane filters, and the volume of water filtered was recorded. The filters were then allowed to dry in a 60&ordm;C drying oven for a period of four days, after which they were re-weighed. 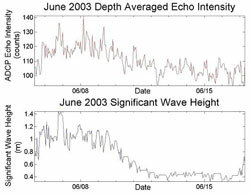 The June 2003 ADCP depth-averaged echo intensity and significant wave height data are shown in Figure 3. The swell during the first week of deployment was marked by a significant (upper 1/3) wave height of approximately 1.3m over a period of five days. The echo intensity correlated with significant wave height had a maximum correlation coefficient of 0.90 at 0 hours of lag. Figure 6. June 2004 cross correlation analysis between cross shore current velocity and water depth (tidal signal) at ADCP site. The June 2004 depth averaged echo intensity, tidal signal, and long shore and cross shore current velocities are shown in Figure 4. During this deployment, the depth ranged from 12m at low tide to 14m at high tide, with a strong diurnal inequality for the first five days. Maximum long shore current velocity was 0.20 m/s, without a clear correlation with the surface tidal height. The correlation analyses for the long shore current velocity and the tidal signal against echo intensity are graphed in Figure 5. The current velocity correlation had a maximum correlation coefficient of 0.251 at 1 hour lag. The tidal signal analysis had a maximum correlation coefficient of 0.198 at 12 hours lag, and a minimum of -0.223 at -4 hours lag. Correlation between the tidal signal and the cross shore current velocity is shown in Figure 6. A maximum correlation coefficient of 0.581 was present at -8 hours lag, and a minimum correlation coefficient of -0.524 was present at -12 hours lag. The July 2004 ADCP depth-averaged echo intensity, SCUFA turbidity, and significant wave height, are shown in Figure 7. Two large swells occurred during this deployment, one lasting for 2 days with a maximum significant wave height of 1.25 m, the other lasting for 3 days with a maximum significant wave height of 1.35 m. The correlation analysis for the June 2004 data set is shown in Figure 8. The SCUFA data correlated with the significant wave height data had a maximum correlation coefficient of 0.547 at 24 hours lag. The ADCP echo intensity data correlated with the significant wave height data had a maximum correlation coefficient of 0.668 at 0 hours lag. When the echo intensity was correlated with the SCUFA turbidity, a maximum correlation coefficient of 0.549 was found at 24 hours lag. The suspended sediment analysis of the in situ water samples yielded a concentration in mg/L, simply by dividing the dry weight of the sediments by the volume of water filtered (Figure 9). Values ranged from 1.2 mg/L to 9.9 mg/L, and some values had over 100% error. Figure 7. July 2004 depth averaged echo intensity (top), SCUFA turbidity with linear trends removed (middle), and significant wave height (bottom). The anomalous peak in echo intensity on 7/20 is most likely due to a coral spawning event on that date. The correlation between ADCP echo intensity and the significant swell event in the June 2003 data set supports the hypothesis that turbidity increases the most during a swell. The most plausible explanation for this strong correlation is that the increased wave energy allowed for more re-suspension of sediment. Although the tides and currents correlated with echo intensity much more weakly than with significant wave height, valuable information can still be drawn out of these data. A slightly larger negative correlation with the tides indicates that low tide height is usually related to a higher echo intensity reading. The correlation between the tidal signal and cross shore current velocities (Figure 6) strongly suggests that an outward cross shore current exists while the tidal height is dropping, which could carry terrestrial and near-shore sediments off-shore to the study site. This would explain the stronger negative correlation between echo intensity and tidal signal. It is interesting to note that the correlation between the predominant long shore currents and the ADCP echo intensity has a one hour lag to maximum correlation coefficient. Since maximum current energy would be expected to coincide with maximum suspension at the site, the lag present indicates a source of suspended sediments approximately one hour distant. Reasonable estimates of a mean current velocity of 0.06 m/s, over a time period of six hours, can be interpreted from the ADCP data. If this current velocity is assumed to remain constant outside of the sampling area, suspended sediment sources could be located at a maximum distance of 1.3 km from the site. Although this simple calculation is not an absolute indicator of suspended sediment sources, a sandy back reef area at Ala Moana Beach Park is located within this distance and might be influencing turbidity at the ADCP site. Figure 8. July 2004 cross correlation analyses between SCUFA turbidity and significant wave height (top), ADCP echo intensity and significant wave height (middle), ADCP echo intensity and SCUFA turbidity (bottom). Due to a decreased magnitude of correlation, the scale on the correlation plot of ADCP against SCUFA varies from the other two in this figure. Biofouling of the SCUFA sensor could be explained by an increase in nutrients due to the higher turbidity observed. Perhaps the most surprising results from this study are those comparing SCUFA and ADCP readings over the same time period. It was expected that the SCUFA data would concur with the ADCP data, since they are both measuring scatterers in the water. However, the SCUFA data shows only one peak, approximately 24 hours after the second swell event of the deployment, while the ADCP data appears much more similar to the significant wave height, with two distinct periods of increased echo intensity. Excluding the possibility that the sampling methods or data were inaccurate, there are several hypothetical explanations for this deviation from expected results. The first potential source for variation is in instrument distance from the sea floor. The ADCP was secured immediately at substrate level, while the SCUFA was mounted approximately 1.5 m above the sea floor. The ADCP's proximity to sediments that could be re-suspended from the bottom might explain how a greater suspended sediment concentration immediately following the swell could be interpreted from this data set. The SCUFA was also placed approximately 100 m away from the ADCP, closer to shore and slightly west. Although a significant variation in turbidity over a distance of 100 m seems unlikely, it is a possibility. The variation in these data could also be explained by biological effects related to turbidity. Physical forcing, by suspending nutrients as well as sediments, may produce algal blooms and increase phytoplankton densities after turbidity has decreased to standard conditions. There exists a good possibility that the SCUFA would show a greater response to this effect than the ADCP, due to the light absorbing properties of photoautotrophic organisms. Figure 9. Suspended sediment concentration from filtered water samples. Error bars represent cumulative sampling error. Due to the extremely low suspended sediment concentration, errors were too great to correlate absolute changes in turbidity with either optical or acoustic data. The significance of these concentrations is still useful, however, for setting a scale for the changes in suspended sediment concentration, which varied at most 18 mg/L during a significant south shore swell. Comparison between ADCP echo intensity and actual suspended sediment concentration would require many more in situ sample replicates, due to ADCP measurements being averaged both spatially (over four beams and the entire water column) and temporally (over an hour), and due to in situ samples only providing one data point in space and time. This study was the first step towards understanding the turbidity conditions on the south shore of Oahu, and the relationship between turbidity conditions and physical forces. Completely understanding this relationship has gained significance with the increased global concern over the health of coral reef ecosystems, and can only be achieved through further research. One possibility for continuing this study would be placing SCUFAs at varying depths and using a modified version of the sonar equation to analyze the ADCP data; this would allow changes in turbidity with depth to be monitored. Using a more appropriate point-sampling particle sensor instead of the SCUFA might also be beneficial. A final idea would be to measure the amount of biotic versus abiotic suspended solids and compare it to the ADCP and SCUFA turbidity. The authors gratefully acknowledge support from NSF grant #023600 and the University of Hawaii Sea Grant College Program. The authors would also like to thank Michael Cooney, Nicole Jones, Marion Bandet, and Pedro Hdry, whose expert advice and discussions were much appreciated. Alvarez LG and SE Jones. (2002). Factors Influencing Suspended Sediment Flux in the Upper Gulf of California. Estuarine Coast Shelf Sci. 54:747-59. Crawford AM and AE Hay. (1993). Determining Suspended Sand Size and Concentration from Multifrequency Acoustic Backscatter. J Acoust Soc Am. 94:3312-24. Deines KL. (1999). Backscatter Estimation Using Broadband Acoustic Doppler Current Profilers. In: Anderson, S.E., et al. Proceedings of the IEEE 6th working conference on Current Measurement. 249-53. Eich ML and MA Merrifield. (2004). Structure and variability of semidiurnal internal tides in Mamala Bay, Oahu, Hawaii. J. Geophys Res. 109. Holdaway GP, et al. (1999). Comparison Between ADCP and Transmissometer Measurements of Suspended Sediment Concentration. Cont Shelf Res. 19:421-41. Klein R. (2003). Investigating Sediment re-mobilization due to Wave Action by Means of ADCP Echo Intensity Data Field Data from the Tromper Wiek, Western Baltic Sea. Estuarine Coast Shelf Sci. 58:467-74. Merrifield, M.A., and Holloway, P.E. (2002) Model estimates of M2 internal tide energetics at the Hawaiian Ridge. J Geophys Res. 107:10.1029/2001JC00996. Rogers CS. (1983). Sublethal and Lethal Effects of Sediments Applied to Common Caribbean Reef Corals in the Field. Mar Poll Bull. 14:378-82. Rudnick D, et al. (2003) From tides to mixing along the Hawaiian ridge. Science. 301:355-7. Smith CR and H Kukert. (1996). Macrobenthic Community Structure, Secondary Production, and the Rates of Bioturbation and Sedimentation at the Kane'ohe Bay Lagoon Floor. Pacific Science. 50(2):211-29. Sutherland TF, et al. (2000). The Calibration of Optical Backscatter Sensors for Suspended Sediment of Varying Darkness Levels. Marine Geology.162:587-97. Telensicki GJ and WM Goldberg. (1995). Effects of turbidity on the photosynthesis and respiration of two South Florida Reef Coral Species. Bull Mar Sci. 57:527-39. Thorne PD and DM Hanes. (2002). A Review of Acoustic Measurement of Small-Scale Sediment Processes. Cont Shelf Res. 22:603-632. Thorne PD, Vincent CE, et al. (1991). Meausring Suspended Sediment Concentration Using Acoustic Backscatter Devices. Marine Geol. 98:7-16. Sediments in Turbulent Currents and Comparison with in-situ Samples. J Acoust Soc Am. 101(5):2603-14. Thosteson ED and DM Hanes. (1998). A Simplified Method for Determining Sediment Size and Concentration from Multiple Frequency Acoustic Backscatter Measurements. J Acoust Soc Am. 104(2):820-30. Webb MP and CE Vincent. (1999). Comparison of Time-Averaged Acoustic Backscatter Concentration Profile Measurements with Existing Predictive Models. Marine Geology. 162:71-90. Wilber CG. (1983). Turbidity in the Aquatic Environment, Thomas Books, Springfield IL. Woolfe KJ, and P Larcombe. (1999). Terringenous sedimentation and coral reef growth: a conceptual framework. Marine Geology. 155:331-45. Wren DG, Barkdoll BD, Kuhnle RA, and RW Derrow. (2000). Field Techniques for Suspended-Sediment Measurement. J Hydraulic Engineering. 126(2):97-104. Zhu XH, Takasugi Y, Nagao M, and E Hashimoto. (2000). Diurnal cycle of sound Scatterers and Measurements of Turbidity Using ADCP in Beppu Bay. J Oceanography. 56:559-65.